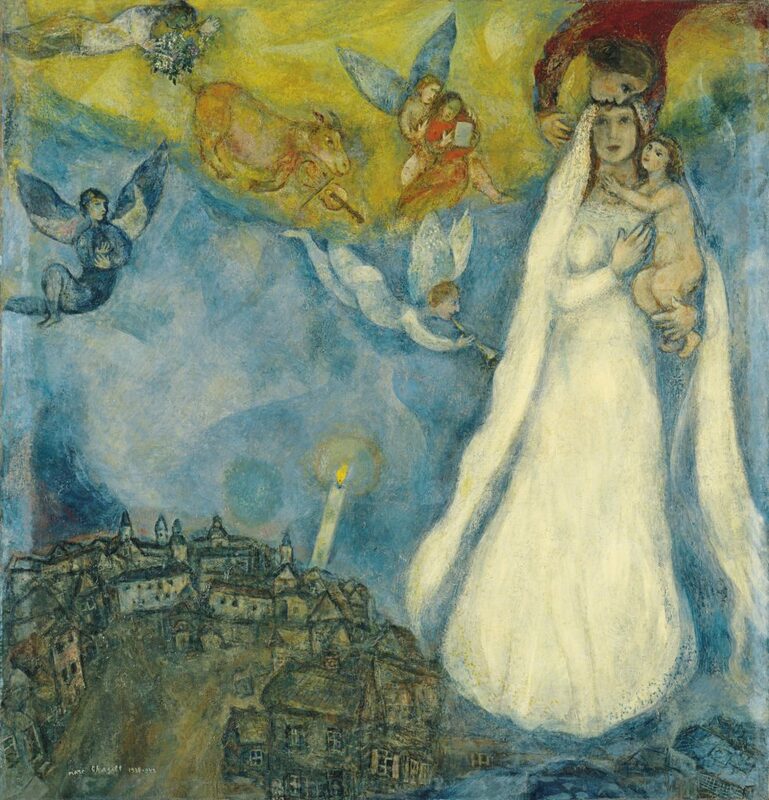 Mark Chagall. The madonna of the village. 1938-1942. I was just about to add the name of Viktor Frankl to this quote — because that’s how I encountered it on several occasions on the internet. But, just in case, I decided to first find it in the book it is supposed to come from, “Man’s search for meaning” (luckily, it’s easy these days — one of the many advantages of e-books) — but it just wasn’t there. A bit more googling, and I found this post by Steven Snyder with more information about the source of this passage (he says the true author is unknown). Thus life has uncannily presented me with a tiny example of the very thing this passage talks about. It was so easy for me to just assume that the attribution to Viktor Frankl is correct (because the passage does indeed express one of the fundamental messages of his book). But there is this space the unknown author talks about — and in this space, this impulse, to just go with what everyone says, met with another, to check the source — and this is where freedom appears. Nowadays, the very existence of this space of freedom is in question: the concept of “free will” seems to be crumbling under the assault of science. I still remember how utterly stunned I was when I first read about this research (in Tor Nørretranders’ “The user illusion: cutting consciousness down to size“): it shows that all our actions start below the threshold of consciousness, quite outside the realm of free will, and it’s only later on that the mind supplies the “rationale” for the action, while at the same time maintaining the illusion that it was it’s own free decision all along. In many ways, this book was a dramatic turning point in my life, the start of a long process of transforming my world view. But now, I believe that the space of freedom does exist — what is an illusion is that the rational mind is the “I”, the locus of our freedom. Most people spend most of their lives in a kind of slumber, within an almost automatic, not-fully-conscious flow of daily repetitions of predictable events and routines. But once in a while, this flow is disrupted, we are shaken out of the slumber — and then, there emerges an urgent need for the space of freedom, but also an unusually good chance to find it and expand it. We often hear that one has to push oneself out of the “comfort zone”, but this usually requires a certain measure of willpower (after all, it is more comfortable in the comfort zone). But when the comfort zone is destroyed for us by life itself, this barrier, at least, is not there anymore. The challenge is just not to lull oneself back to sleep, to the illusion of comfort, but to use this window of opportunity. During a time of great drought, a Taoist master was asked by members of a village if he could help bring rain to their dry fields. They confessed trying many other approaches before reaching out to him, but with no success. The master agreed to come and asked for a small hut with a garden that he could tend. For three days, he tended the garden, performing no special rituals or asking anything further from the villagers. On the fourth day, rain began to fall on the parched earth. When asked how he had achieved such a miracle, the master answered that he was not responsible for the rain. However, he explained, when he came to the village, he had sensed disharmony within himself. Each day, as he tended the garden, he returned a little more to himself. When he returned to balance, the rain came naturally. Tending a garden is not an action intended to change the world; it just returns one to oneself and thus restores the inner balance. It is not “responsible for the rain”. But it is not just contemplation either, because there is no withdrawal from life into one’s mind (quite the opposite, in fact). It dissolves the opposition between vita activa and vita contemplativa, between changing the world and changing oneself, between change-making and being the change. This is a “middle way”, a space between action and contemplation. In contrast to action, it doesn’t seek to change the world (but always does); in contrast to contemplation, it doesn’t let the mind turn unto itself in endless cycles of self-talk, detach itself from the world outside, and drown in the sea of illusions. It is the space where our freedom lives. So how to find and expand the space of freedom? Last week, I decided not to interrupt the “Art in the Age of Consciousness” series in spite of it being seemingly “out of tune” with the radically changed reality, because I believe that art is, if not the answer, but an essential part of it. The problem is, however, this answer is not so much in reading about art and its role in history, but in the practice of art. The practice of art is like tending the Taoist garden — it creates and expands the space between action and contemplation, the space where our freedom lives. It is not a direct political and social action, which is why it may seem pointless or even frivolous, a privileged escape from the harsh realities of life. Neither does it fall under the category of contemplation — there is no withdrawal from life to the inner confines of mind. Art happens in between, outside these familiar categories, and there in lies its ability to create the space of freedom, to return to oneself, and — potentially — to increase harmony in the world. The major theme of “Art in the Age of Consciousness” series is that art is the humankind’s response to the increasing separation between life and consciousness, to “life-alienation” of human beings, and thus to the growing “wall” between “me” and “myself” within each one of us. Art dissolves these walls and boundaries and re-establishes the oneness, the unity of life. But will the rain come? Well, we are not all of us great masters capable of miracles. But that’s besides the point. It doesn’t work like this — it’s not for the artist to know whether the rain will come. And if it does, the artists will have neither credit nor responsibility. And it is more than possible that some direct action will be needed — the point is to be ready to face these challenges from the space of freedom and courage. Readiness is all. Our work is just to tend the garden and thereby return to ourselves. But what if you are not an artist? Or if you are, you find yourself unable to invite inspiration into the time-space of turmoil?